Make sure the St. John's wort supplement you take passed our test and is right for you! Does St. John's wort work? Yes, extracts of St. John's wort have been shown to be effective in treating mild to moderate forms of major depression. However, ConsumerLab.com discovered that 6 out of 10 herbal supplements did not meet quality standards. 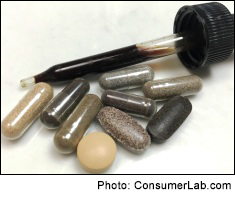 The biggest problem uncovered by ConsumerLab.com was that many products did not contain the key plant compounds (hypericin and/or hyperforin) listed on their labels or expected based on the claimed amounts of St. John's wort. For example, the amount of hypericin found in daily servings of the supplements ranged from as little as 0.11 mg to 2.6 mg — a 20-fold difference. There was even greater variation in amounts of hyperforin, which ranged just 0.13 mg to 36.4 mg. This means you could be getting 280 times as much hyperforin from one St. John's Wort supplement than from another. These enormous differences are likely to impact the effectiveness of products. In short, some of the St. John's wort supplements on the market seem to have little of the herb while others provide substantial and clinically meaningful amounts. All supplements were further tested for potential contamination with the heavy metals arsenic, cadmium, and lead. All pills were checked to be sure they would break apart properly to release their ingredients.